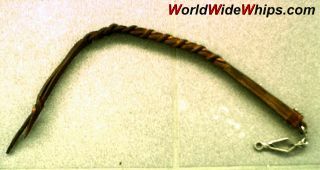 Crude version of a dogwhip, with the layers of leather just glued together at the handle area, then formed to a thong by an uneven slit-braid. Obviously used a lot. As the ones before it combines the function of a whip with that of a dog lead.